We stumbled across an excellent wiki page the other day and wanted to share it with our readers. It is written by two engineering students from the University of Illinois as part of a class project. The information is mostly written from an engineering point of view, as the students share their research on the history and origins of Medical Sonography. One section of this project caught our attention and we wanted to share it here in hopes you can glean more information on what its really like to be an ultrasound technician. The particular information we wanted to share was the interviews that the two students did with real ultrasound technicians. The technicians remain anonymous throughout the interview, but check out some of the questions and answers. We’ve highlighted the questions about the equipment used, and the ultrasound training that is often encouraged and paid for by the employer. Question: What brand and model ultrasound machine do you use? Also any other information on the model may be useful. Our newest machine is the GE Voluson E6. It has an HCAT#H4*********. 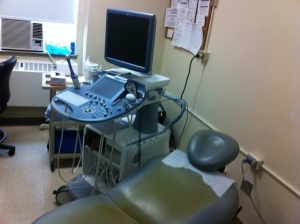 We also have a Sequoia brand ultrasound machine, but the model is much older. We try our best to avoid using this machine. Question : What factors do you think affect image quality? The expertise, experience, and training of the tech. The machine capabilities and the patient. A lot of these are related though. We have many older technicians who do not take advantage of machine capabilities and settings since they were not trained on how to do so. Also, patient size plays a huge role. We get a lot of fat patients here, and navigating through and around the fat is difficult. Also, the organs may not be quite as shaped or aligned as expected on obese people. Some techs who do not have experience working with such big people in the city tend to have a lot of trouble here. So a lot of these factors are linked together. Question : You mentioned that training is important. Is there a specific set of training an ultrasound technician must undergo? We had to go through a 2 year degree program in Ultrasound Imaging. Also, there is an American Registry for Diagnostic Medical Sonography (ARDMS) Certification process. Many hospital will pay for the certification process for their techs. Mt. Sinai paid for our training and certification. Question : <Name Witheld> Why did you switch between being an X-Ray technician to an Ultrasound technician? More money and less radiation. The more money comes with a harder job though. We can’t just setup a machine and take a picture. As an ultrasound technician, we have to look for the abnormality, and then take supplemental images to prove it is an abnormality. Probably the two most interesting questions that we found helpful were those that indicated that image quality of an ultrasound has a LOT to do with the actual technician. That along with the fact that training and continued education is critical to grow in your career as an ultrasound tech.